Steven (Chicagoland, United States) on 27 November 2018 in Architecture and Portfolio. 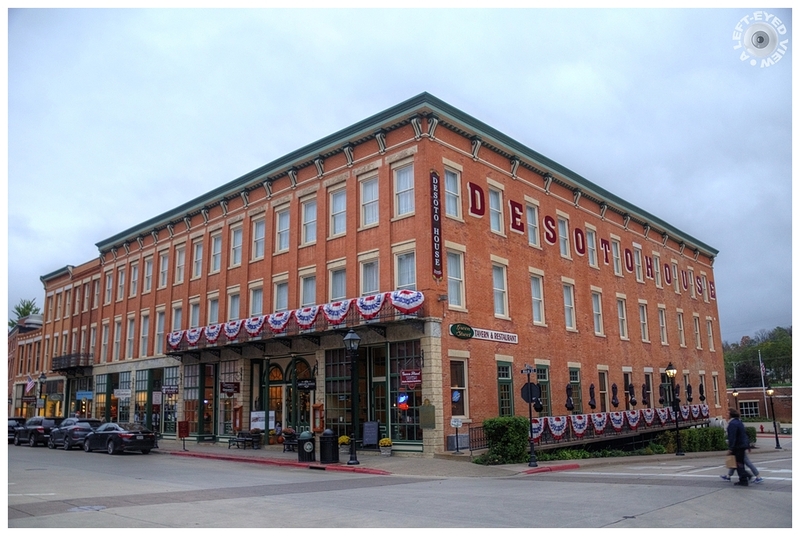 "Opened in April, 1855, the five-story 240-room DeSoto House was the largest and most luxurious hotel in the west. Abraham Lincoln spoke from its balcony in 1856 and Stephen A. Douglas in 1858. Ulysses S. Grant (a Galena native) maintained his 1868 presidential campaign headquarters here. By 1880, Galena's prosperity had faded and the hotel's two upper floors were removed." Verbiage from a plaque on the DeSoto House Hotel, erected by the Illinois State Historical Society in 1959. Given the cloudy overcast that day, I debated going with either a "black and white" or "antique" filter, but kept the color. Photo captured October 14, 2018. Impressive building. I like pink bricks of its walls. The hotel has a great history. A handsome looking house. A historic building, perfectly styled with its years. Une bâtisse imposante, mais j'avoue que je n'aurai pas envisagé qu'il s'agissait d'un hôtel de luxe. An mpressive historic building ! I think that it's a good idea to keep the color for the brick's wall ! A great angle and lovely image. And thank ypu for the information !! A great corner view of this historically significant building. I'm glad you kept the colour, as the paint job is excellent. This gem should easily stand for centuries to come. What a grand looking place. I like this point of view to see the name on the side. a superb framing ! I think that the color is better ! A interesting story of this building. Fantastic photo and I prefer color. Toujours de magnifique cadrage avec toi... Excellent angle. I like the color with the nice warm bricks. Good choice. a beautiful and stately old building. It is impressive how good it looks after having two floors removed. Galena is one one of those historic towns that flared to (near) greatness then fizzled into obscurity. It has quite an amazing history. It is a gorgeous building. I like the sturdy looking architecture. Wonderful point of view. The colors are smooth and beautiful on this cloudy day. An interesting history. An elegant building that is part of the recent history (last 120-130 years) of America. And he's well recovered. It's like new.